Early maps warned sailors of the mysteries and dangers of the sea. Wherever the maps ended in unexplored areas, they would leave the iconic message “Here there be dragons.” By far, the most numerous of the creatures that our medieval pioneers reported were sea serpents. These reptilian monsters would be depicted undulating in the water or coiled around ships, where they would devour unfortunate sailors who got too close to their gaping jaws. Their appearance was often thought to be prophetic—they were harbingers of doom and disaster well before they became a zoological mystery. Here are 10 of the more famous of these calamities of the deep sea. Before he wrote about the critter for which he’s most famous, Olaus Magnus set down another account in his Historia de Gentibus. It’s one of the oldest widely accepted accounts of what we think of today as a sea serpent. 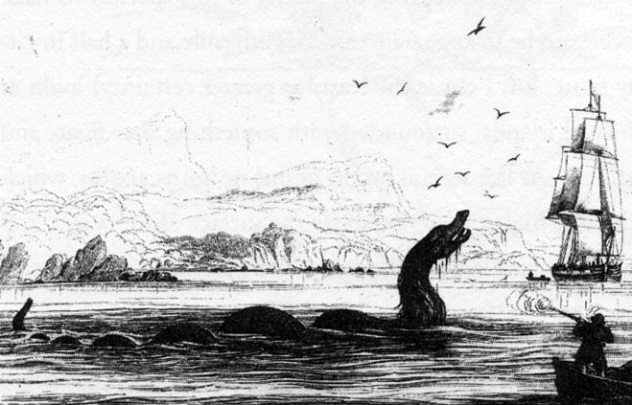 In it, the Catholic priest who was exiled from his Swedish homeland spoke of a creature “of an astonishing size”—about 23 meters (75 ft) long—that was sighted in 1522 near an island in the Diocese of Hammer called Moo, “which portends a change in the Kingdom of Norway, as a comet does in the whole world.” Such prophecies are a common theme in early sea serpent tales. The appearance of these creatures was said to foreshadow some terrible event—in this case, the banishment of King Christiernus and “a great persecution of Bishops”—which may be why sea monsters were often called “calamities” in the 16th and 17th centuries. Magnus’s description could almost serve as a template for all of the sightings that took place in the future. His account of the Sea Orm was accepted as fact until the early 17th century, when Erik Pontoppidan, Bishop of Bergen, began to question the details of Magnus’s story in his Natural History of Norway. Henry Lee even dismissed Olaus’s Sea Serpent as giant calamari in his now-classic Sea Monsters Unmasked. 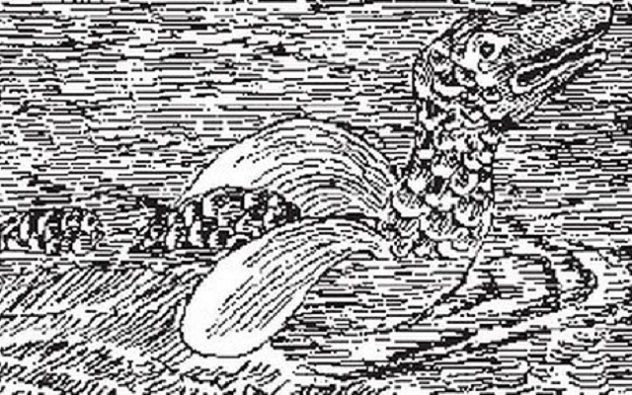 The first American sea serpent sighting took place off the coast of New England near Cape Ann, Massachusetts in 1639. The creature would eventually become known as “Gloucester’s Sea Serpent,” named after the harbor just north of Boston. 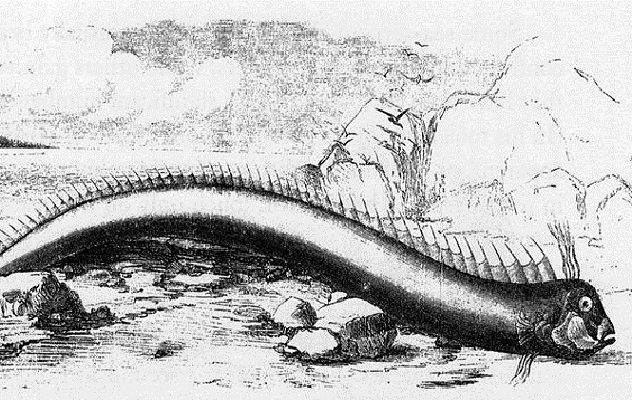 The monster was first reported in 1641’s An Account of Two Voyages to New England by John Josselyn, who wrote “They told me of a sea serpent, or snake, that lay quoiled up like a cable upon the rock at Cape Ann; a boat passing by with English on board, and two Indians, they would have shot the serpent, but the Indians dissuaded them, saying that if he were not killed outright, they would all be in danger of their lives.” Three years later, Obadiah Turner reported a similar incident near Lynn, Massachusetts, where he allegedly saw a serpent as wide as a wine pipe and around 27 meters (90 ft) in length. While sporadic sightings continued through the 18th and 19th centuries, the serpent had become a seasonal phenomenon by the early 1900s, much like today’s “lake monsters.” In 1917, the Linnean Society of New England performed one of the first scientific investigations of a sea serpent, providing a list of carefully chosen questions to eyewitnesses in an attempt to discover the creature’s true nature. They concluded that a dead snake which had been found on the coast of Cape Ann was the creature’s progeny and named it Scioliophis atlanticus because of the scalloped shape of its back. Rather than a new species, the snake turned out to be a common black snake with a deformation. Hans Poulsen Egede was a Dano-Norwegian Lutheran known for his missionary work throughout Greenland, where he eventually settled in the town of Gothaab. In 1722, he wrote a report to his employer, the Bergen Company, which was published without his knowledge in 1729 as Det gamle Gronlands nye perlustration. It was the first written account of Greenland and so popular that it was translated into German the following year. He also published the first book ever written in the Eskimo language, beautiful and meticulous maps of Greenland, and excellent woodcut illustrations that demonstrated a powerful eye for natural detail. When he reported that he had witnessed a sea serpent off the coast in 1734, people paid attention. Egede wrote that on July 6, he and his crew witnessed a “frightful sea monster” so large that it towered over the ship’s maintop. He claimed that it had a long snout and broad flippers and “spouted water like a whale,” although the translation of this phrase is heavily contested. The prophetic nature of sea serpents might have still been a common belief at this time, since Egede made sure to mention that “the following evening, [they] had very bad weather.” A fellow missionary named Mr. Bing captured the creature’s likeness on a map of the region. Based on this illustration and translations of Egede’s writing, Henry Lee believes that the serpent was actually a giant squid, a claim that Antoon Cornelius Oudemans refutes in his The Great Sea-Serpent. Bishop Pontoppidan may have been skeptical of medieval accounts of sea serpents, but he also believed in fish the size of islands as well as the legendary kraken. He documented several contemporary accounts that he felt were credulous in his Natural History of Norway. 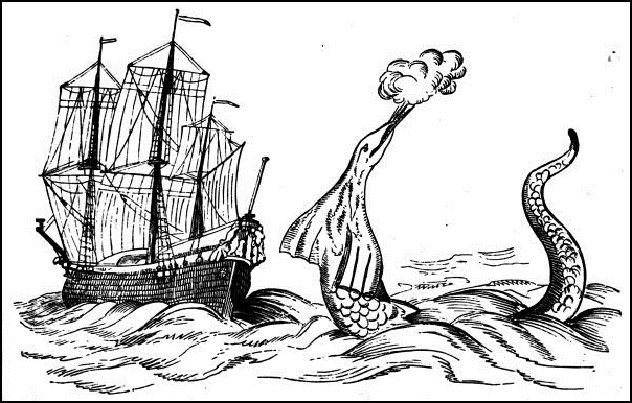 One of the most important of these was the so-called “Maned Sea Serpent” of 1746. The account of this fearsome creature came from a letter written by naval captain Lawrence de Ferry to a Mr. John Reutz. The captain also claimed to have witnessed seven or eight coils of the serpent’s body, which were a full fathom apart. The famous illustration of the creature was drawn by clergyman Hans Strom, based on descriptions given by Reutz and a man named Teuchsen of Herroe. Those who claimed to witness the Maned Serpent said its body undulated in a vertical, up-and-down manner, a type of body movement impossible for snakes but a common feature ascribed to such creatures. This has led many to conclude that some sightings are misidentifications of a line of porpoises following each other, which is a well-known habit of smaller cetaceans. 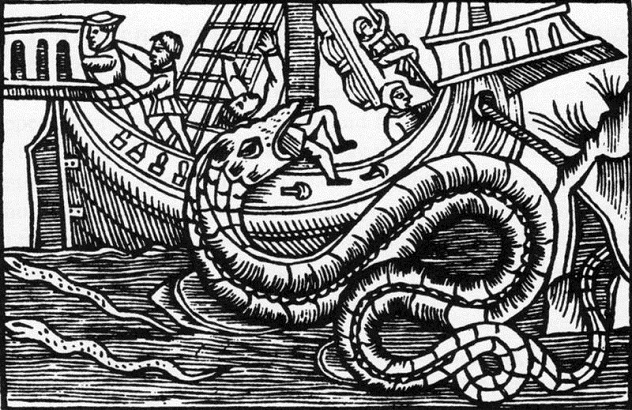 The Norwegian coast used to be the only place that was said to be blessed with sea serpents, but once America got in on the act, reports off the coast of New England continued for hundreds of years. 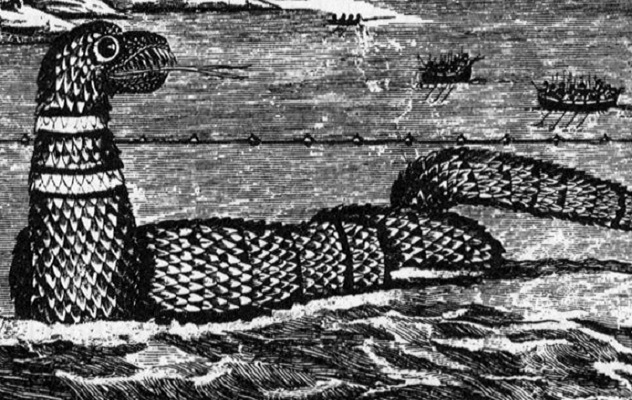 One of the more interesting sightings occurred in 1818, when the marshal of the district of Nahant, James Prince, claimed to have spotted a sea serpent no fewer than seven times. A drawing by Prince shows a fish tail and scales (despite Prince specifically stating that he had not seen either), what look like fins on its back, and a head that looks more like a duck than a sea serpent. Apparently, Prince was better at written description than he was at art. According to Andrew Hebda, a zoologist for the Nova Scotia Museum of Natural History, there have been over 31 sightings of “sea monsters” in and around Nova Scotia over the last 140 years, the last of which was reported as recently as 2007. 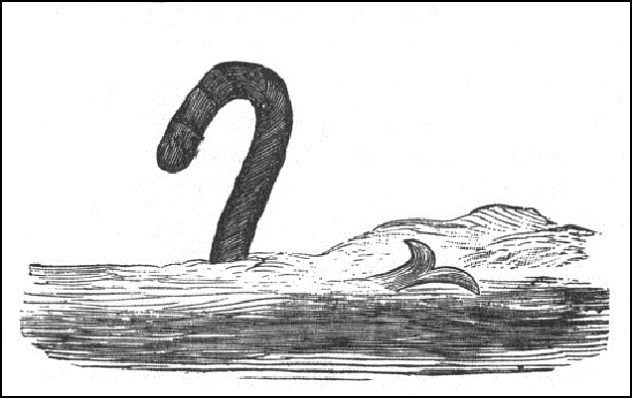 It all began on July 15, 1825, when a “gentleman, accompanied by some ladies” witnessed a large sea serpent while riding past a tan pit in the harbor of Halifax. It was described as about 18 meters (60 ft) long and said to move “by a wiggling sort of motion” about 55 meters (180 ft) from the shore. Another sighting occurred on May 15, 1883, when several members of the British Army and two members of the Royal Navy on a boat bound for a popular fishing spot somewhere between St. Margaret’s Bay and Mahone Bay got bored and started taking pot-shots at some grampuses. Suddenly, “the head and neck of some denizen of the deep, precisely like those of a common snake” rose out of the water. The men admitted that its exact dimensions were difficult to estimate but agreed that the head of the serpent was 2 meters (6 ft) long and the visible portion of the neck about 25–30 meters (80–100 ft). They described its width as that of a moderate-sized tree. Some skeptics, including Oudemans and Henry Lee, believe that the existence of the oar fish can account for a great number of sea serpent sightings that the Halifax sighting greatly resembles. The giant oar fish, often called “the king of herrings,” is the longest bony fish alive. It reaches lengths of up to 8 meters (26 ft), and some believe it can grow as long as twice that length. It often comes to the surface when sick or dying. It’s easy to see how sightings of the oar fish can inspire sea serpent accounts. 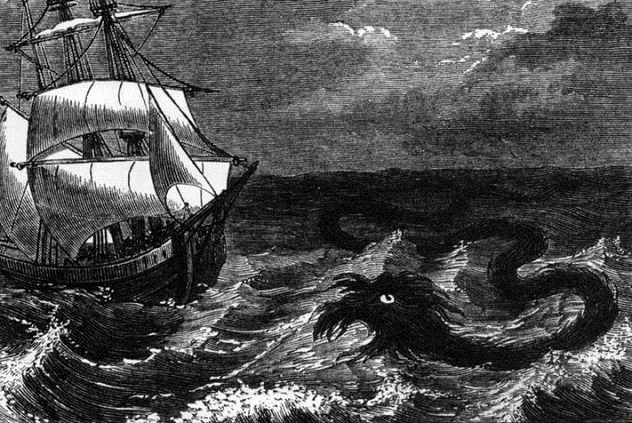 Perhaps the most famous of all sea serpent sightings is the unusual case of the monster reported by the crew of the HMS Daedalus as it traveled to St. Helena. The sighting occurred on August 6, 1848, between the Cape of Good Hope and St Helena. It was witnessed by many well-respected members of society. In an official report to the Admiralty, Captain Peter M’Quhoe wrote a meticulously detailed account of the creature. He said that its head remained aloft 122 centimeters (4 ft) from the water and that the visible portion of the animal measured 18 meters (60 ft) or more. He saw no visible means of locomotion and remarked that it was so close that “had it been a man of my acquaintance, I should have easily recognized his features with the naked eye.” He described it as 38–40 centimeters (15–16 in) in diameter, dark brown in color with yellowish-white areas at the throat, and without fins but with either a mane or seaweed covering its head. While the captain insisted that the head was that of a snake, a newspaper account notes that through glasses, the creature’s eyes, nostrils, and mouth could be made out and resembled a lizard. The captain arranged for illustrations to be drawn based on the eyewitness accounts, which were printed in the Illustrated London News. These engravings and sketches have become some of the most famous in all of cyptozoological lore. It’s also worth noting that the HMS Daedalus sightings were the first time that—aside from the usual outsized eels, squids, etc.—a Plesiosaurus was named as a possible explanation for sea serpent sightings. On July 19, 1879, a journal called The Graphic published an article and printed an engraving based on a sketch sent by a Captain Davidson of the steamship Kiushiu-maru. The article was also published in the November 18th, 1880 edition of Nature. Though Captain Davidson sent a signed statement, countersigned by his chief officer, the contents were either the work of crackpots or incredible. In the statement, Captain Davidson describes being 14 kilometers (9 mi) from the shore of Cape Satano at the Isle of Kiu Siu, Japan when a whale jumped clear out of the sea about 400 meters (1,300 ft) from the ship. What was remarkable about this was that Davidson “distinctly saw something holding onto the belly of the whale.” After another jump, the two men “observed what appeared to be a large creature of the snake species rear itself about 30 feet out of the water,” which Davidson said was as thick as a junk’s mast. After standing for a few seconds in an upright position, it descended back into the water. In the second sketch, Captain Davidson drew the creature with a double-finned tail, but in Oudeman’s account of the story in The Great Sea Serpent, he points out that this probably belonged to the whale, not the serpent. The thrashing water might have created the illusion that the two separate elements were joined. This wasn’t the first time that sea serpents have been seen attacking whales. In 1876, Captain George Drevar of the barque Pauline signed statements and provided sketches of another attack off the northeast coast of Brazil. Even if these sightings are not sea serpents, it’s equally incredible to contemplate that these people might have been privy to a sight that has never before been directly documented: a battle between a whale and giant squid. Cadborosaurus willsi, nicknamed “Caddy,” is a sea serpent believed by some to inhabit the waters of the North American Pacific Coast, especially near British Columbia. Its name is derived from Cadboro Bay in Greater Victoria, where the first sightings occurred. Sightings and local Native American lore about the creature go as far back as 1892, but it was in 1933 that Archie Wills, the editor of the Victoria Times, sponsored a “name that creature” contest and chose “cadborosaurus” as the winner. Caddy has been one of the most documented cryptids ever recorded, with an admirable list of reputable eyewitnesses and remarkably consistent testimonies down the years. Like most sea serpents, Caddy is described as long and thin, with several “humps” and a horse-like head with a mane or a crest of some sort. Several strange carcasses that have washed ashore in the area over the years have been attributed to the monster, including a carcass discovered on the shore of Camp Fircom in 1936, a supposed juvenile found in the belly of a sperm whale in 1937, and the Effington Carcass on Vancouver Island in 1947. Most of them have been determined to be baleen whales, but a few are still mysteries. On Halloween 1983, two construction workers repairing a stretch of California highway reported seeing a sea serpent from the cliff face overlooking Stinson Beach, north of San Francisco. In total, five workers witnessed the creature. It was described as being about 30 meters (100 ft) long with a large, horse-like head. A passing truck driver who also witnessed the event claimed that the creature had two “humps” and likened it to a giant eel. Curiously, as it swam away, it was said by some to be followed by about 100 sea birds and two dozen seals. These accounts set off a wave of sightings in the San Francisco Bay area, ending with the final sighting at Costa Mesa. A much older New York Times account reported an April 5, 1885 story from the same area. 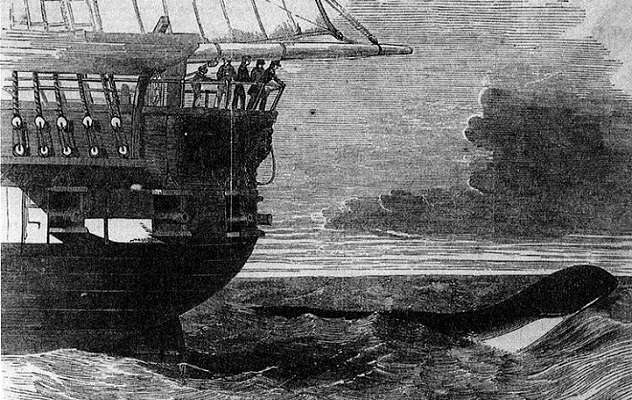 It described what steamboat passengers called “a huge black monster” that rose to a height of 3 meters (10 ft) above the water, displaying a mouth 120 centimeters (4 ft) wide with “rows of sharply pointed teeth.” Its tail, which was said to be 18 meters (60 ft) long, was seen as it plunged back into the depths. Lance LeClaire is a freelance artist and writer. He writes about subjects ranging from science and skepticism, atheism, and religious history and issues to unexplained mysteries and historical oddities, among other subjects. You can look him up on Facebook, or keep an eye for his articles on Listverse.